A RUP LIFE: SCOOBY-DOO! MASK OF THE BLUE FALCON Now Available! SCOOBY-DOO! MASK OF THE BLUE FALCON Now Available! Be sure to check out SCOOBY-DOO! 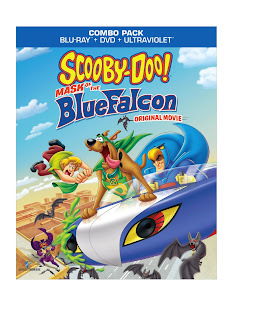 MASK OF THE BLUE FALCON on Blu-ray combo pack. Join Scooby and Shaggy on a fantastic adventure! Get set for superhero hi-jinks and adventure in Scooby-Doo! Mask of the Blue Falcon as Scooby-Doo! and the gang go head-to-head with a super villain they thought only existed on TV! Scooby-Doo! and his pals make big plans to attend a popular comic book convention. No one however, is more excited than Scooby-Doo! and Shaggy because they get to be part of a big premiere of a brand-new movie that’s based on their favorite superhero, Blue Falcon. Fiction becomes reality however when the hideous Mr. Hyde, a monstrous super villain from the classic Blue Falcon television series comes to life and terrorizes everyone at the convention. SCOOBY-DOO! MASK OF THE BLUE FALCON is available at your local retailer and online at Amazon! Thank you to WHV for providing a product for review. As always all opinions are strictly the opinons of A Rup Life and individual results may vary!